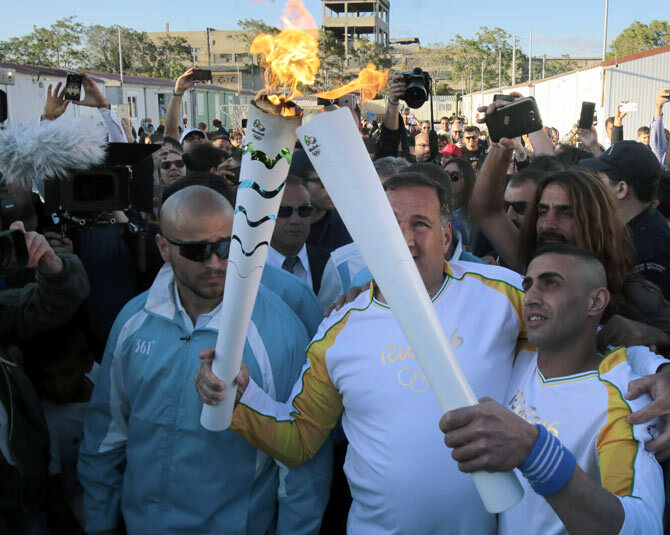 A Syrian amputee swimmer ran with the Olympic flame through a refugee camp in Athens on Tuesday to highlight the plight of the million people who fled their homes for Europe since last year. Greece has been the main entry point into Europe since 2015 for the influx of refugees and migrants from conflict-ridden or poor countries in the Middle East and beyond. Ibrahim al-Hussein, who has been granted asylum in Greece, crossed the Aegean Sea from Turkey to Greece on a rubber boat in 2014 after having lost part of his leg in a bombing in Syria. Torch raised, a beaming al-Hussein crossed through a throng of journalists at the Eleonas camp, which hosts about 1,500 refugees. "I want to send a message to every athlete who was an athlete in his country and had to migrate, to become a refugee ... To not stay in the camp and do nothing. 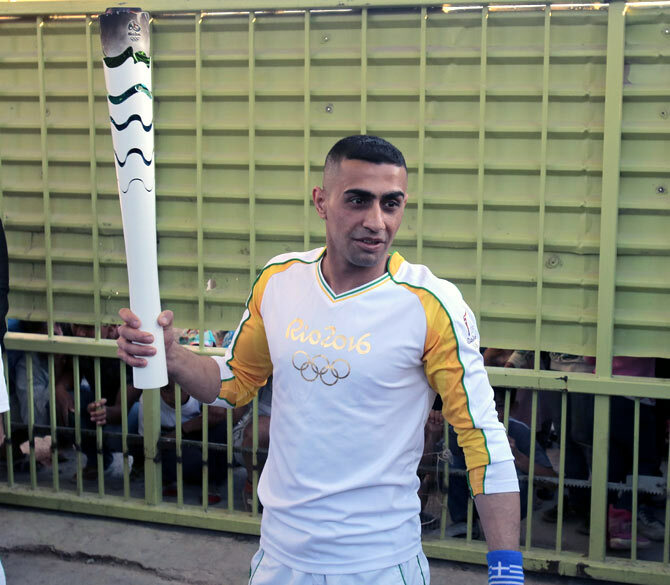 To go out there and work for their dream to come true," said 27-year-old al-Hussein, the son of a swimming coach. Al-Hussein used a 36-metre high suspension bridge in the city of Deir al-Zor as a diving board until it was destroyed in 2013 during the war. His right leg was amputated from the middle of the calf and he walks with a prosthetic leg that a private doctor arranged for him to receive for free. The International Olympic Committee (IOC) had said it wants to draw the world's attention to the plight of refugees. Up to 10 refugees are to compete in Rio in August under the Team of Refugee Olympics Athletes, chosen from a pool of 43 prospective Olympians identified by the IOC and supported with funds to train. Al-Hussein, wearing a wristband with the Greek flag, is not in that team but said he hopes to compete for Greece. "I really hope to reach the Olympics in Rio - but with Greece. I love Greece," he said with a laugh. Spyros Capralos, head of the Hellenic Olympic Committee, said al-Hussein would be competing in a national swimming championship in coming days. "We hope that he will make it to Rio," he said. He did not say what events al-Hussein could compete in. 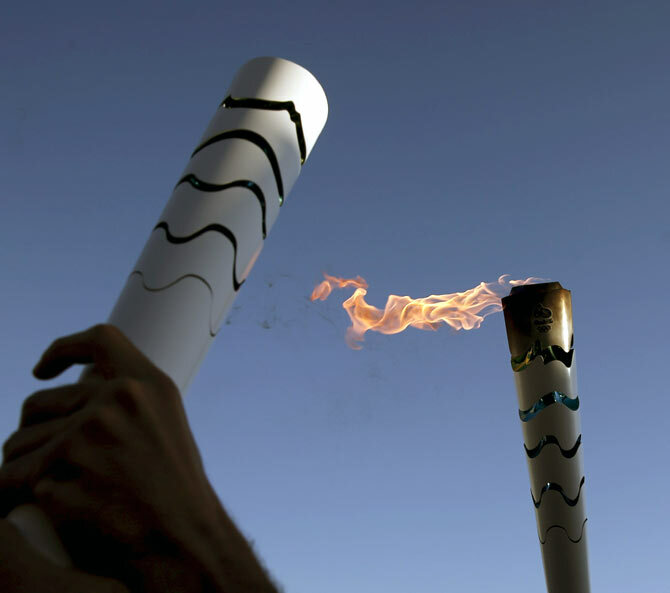 The Olympic torch was lit in Ancient Olympia in southern Greece on Thursday, starting a six-day relay across the country. It will be handed over to Brazil on Wednesday and arrives in Brazil on May 3 for a 100-day relay across the country.